We’d love your help. Let us know what’s wrong with this preview of Picturing the Big Shop by Government Publishing Office (U.S.). 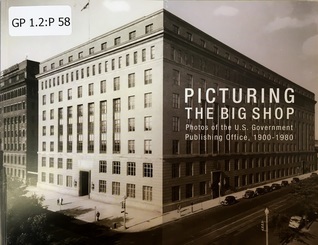 The U.S. Government Publishing Office (GPO) releases a new photo history of the agency. Picturing the Big Shop is a collection of 200 photos, including many that have never before been published, comprising the historical record of everyday life at GPO from 1900 to 1980. This GPO “family album” provides, in black and white and sepia, a revealing look at the equipment, the The U.S. Government Publishing Office (GPO) releases a new photo history of the agency. Picturing the Big Shop is a collection of 200 photos, including many that have never before been published, comprising the historical record of everyday life at GPO from 1900 to 1980. This GPO “family album” provides, in black and white and sepia, a revealing look at the equipment, the buildings, and the working lives of the men and women of GPO over the years who helped carry out the agency’s mission of Keeping America Informed. To ask other readers questions about Picturing the Big Shop, please sign up. Quite a fascinating collection of photographs of the GPO. An engaging and informative history of GPO. George Barnum and colleagues have done an excellent job mining the archives of GPO to assemble the story of printing and publishing for the government. Should be required reading for document librarians everywhere!